"Restoring and protecting ecosystems, people and property"
Who do you call when you need professional tree removal? Atlanta’s leading tree professionals, 72 Tree, Seed & Land Company. For all their beauty and grace, falling trees are nothing short of deadly. There is no grey area: Trees that represent a potential danger require action. Often, the only solution is to cut hazard trees down; but in some cases, supportive measures may eliminate the need for tree removal. Atlanta, GA residents often need our help with pines and oaks, but tuliptrees and maples cause problems as well. Additionally, thanks to their poor structure, Bradford pear trees are infamous for shedding large limbs during bad weather. So if you have an emergency and live in North Georgia, our Alpharetta Tree Service team can help; otherwise our Atlanta team of experts is ready to respond. Give us a call in any situation, our professionals are available 24/7! What distinguishes the professionals at 72 Tree from the “other guys”? For the safety of your family and our staff, 72 Tree operates in full compliance with OSHA and DOT guidelines. 72 Tree conducts all tree removal and pruning operations in accordance with ANSI a300 and ANSz133.1 standards, as set forth by the International Society of Arboriculture. 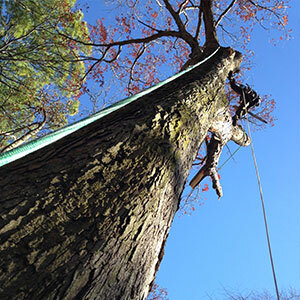 Unlike too many budding tree companies, 72 Tree complies with all relevant federal, state and local laws, as well as tree ordinances in cities such as Atlanta GA.
72 Tree utilizes specialized removal techniques, designed to minimize damage to the canopies, trunks and roots of nearby trees. The professionals at 72 Tree carry out precision removal to reduce the chances for damage to your local infrastructure, driveways, hardscapes, landscaping and other components of your property. As true professionals, 72 Tree only uses properly rated equipment for every job, whether the task calls for pruning saws, chainsaws or 90-ton cranes. Unlike many companies who utilize inexperienced workers to save money, 72 TREE understands the dynamics and the high risk associated with tree removal, cranes and high voltage. Our ‘in house’ testing and training ensures our clients that they are getting the highest trained staff in the Southeast. While cross training is important for working together as a team, 72 TREE trains their staff to do a specific job very well. 72 Tree has performed hundreds of extremely dangerous and difficult tree removal for over 45 yrs with the highest safety record in the country. Many of the “other guys” in the tree business rely on salesmen – who may not have tree experience – to estimate the cost of your job. Once work starts, and the cost doubles or triples, these salesmen are nowhere to be found. By contrast, 72 Tree ensures that the arborist who quotes your estimate is at the job site for the duration of the project to address any concerns that may arise. Unlike some other tree companies, 72 Tree only uses NCCCO (National Commission for the Certification of Crane Operators) certified crane operators. 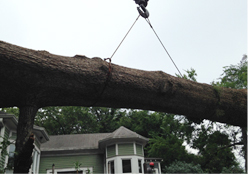 When should you call 72 Tree to evaluate a tree for removal? Trees can exhibit several signs that failure may be imminent. Such hazardous trees require investigation from a competent tree removal service. Atlanta’s premier tree service, 72 Tree, has over 40 years of experience in helping home and property owners remove hazardous trees before they cause a problem. Contact 72 Tree If your trees exhibit any of these symptoms, and let one of our certified arborists inspect the tree, assess the level of risk involved and propose a plan of action. Dead trees usually require immediate removal. Large dead branches and areas of significant die back may indicate that the tree has large amounts of internal decay. Trees that tilt suddenly, exhibit exposed roots or begin pulling up soil are an immediate danger. Large hollows often indicate that the center of the tree has some degree of decay. Cracks indicate that the tree has already partially failed, and a catastrophic failure may be imminent. Tree roots that encircle the tree, called girdling roots, may disrupt its ability to transport water and nutrients throughout the tree. Mushrooms or fungal growth on trees can be indicative of serious decay within the tree. Structurally poor branch junctions are at high risk for failing. Though many traits can signify a weak branch junction, narrow angles between branches (making a “V” rather than “U” shape) are often problematic. Do you need a permit to remove a tree from your property? Permits are required for removing trees in some of the cities surrounding metro Atlanta. Tree removal permits are always easier to obtain with the help of a certified arborist, who can inspect your tree first and determine its likelihood for failure. Contact 72 Tree for your tree removal needs today. For information about emergency tree removal in and around Atlanta, please call us now at 678-223-5495 or contact us here. 72 Tree assumes no responsibility for conclusions or recommendations as trees are living organisms subject to the many elements of nature and environmental conditions, which means that they may fail at any given time. “Restoring and protecting ecosystems, people and property”We offer professional emergency tree removal services in Alpharetta & Metro Atlanta Area. Contact us today for tree cutting services in Alpharetta & Roswell, GA.